The “Millennium Walkway” between our existing Pavilion and the New Grafton Center was established in the year 2000 to connect the “NEW” with the “OLD”. It was decided at that time to create the walkway with laser engraved brick pavers. 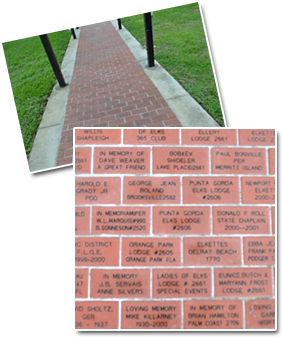 With a donation of $ 50.00 an engraved brick would be placed in the walkway. The proceeds from these donations is received by Florida Elks Charities, Inc. to help funding of the Harry-Anna Trust Fund.